Fine blue roots are painted onto a surface composed of twelve wooden boxes that have been dyed white. The central element, located in the foreground, is divided into three parts. On the bottom, handwritten texts, dating from 1903 and found in pharmaceutical archives, are engraved onto each other on a steel surface that has been finished with a patina. 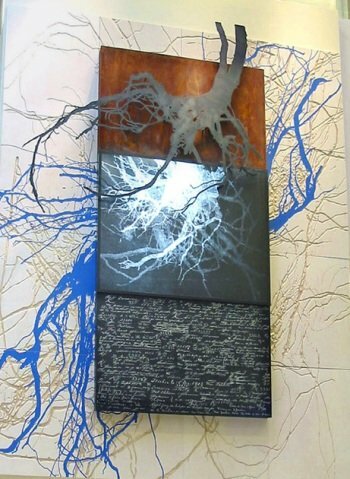 The central part is backlit and displays a digital print of roots. The top part represents a tree trunk. Provides a comparison between the health and social services network and the hidden roots of a big tree. Illustrates the contribution of regional boards to the welfare of the individual in this society.